View More In Marble Runs. 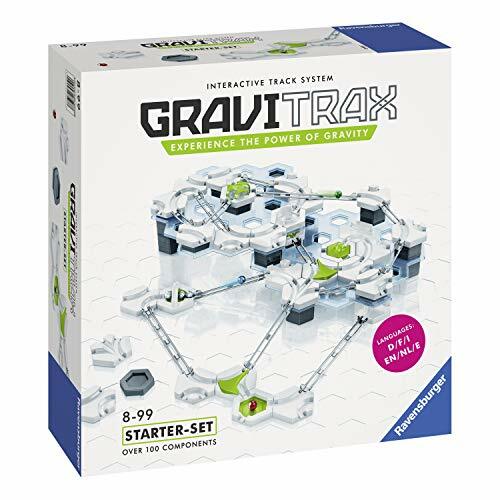 What you get - gravitrax is an innovative marble run and STEM toy for boys and girls made with high quality components, designed for ages 8 and up. It comes with 122 pieces and is an ideal holiday or birthday gift for Smart, curious kids aged 8 and up. Innovative - the gravitrax interactive track system allows you to design and build your own race tracks and experiment with gravity, magnetism, and kinetics to propel your ball to the finish. Clear instructions - comes with clear instructions so that you can start building and playing within minutes. Develops critical skills - playing and building with gravitrax builds spatial reasoning and planning skills, and provides a great stealth learning experience. As seen on TV - gravitrax was featured on 'live with Kelly and Ryan' as one of the best products shown at the 2018 new York toy fair.